Flights are pretty easy right? I mean normally you’re just travelling from point A to point B and there isn’t much of an issue irrespective of where you book the flight. Sometimes there is a delay or even a cancellation but the airline normally sorts these things out right? Flights are pretty much a commodity, and as such price is generally the determining factor for where people book. Well the above is true most of the time and I admit that if just flying domestically at home I’ll normally just book online myself too. But … If you’re considering a trip to South America and/or a cruise to Antarctica (probably from Argentina) then I thought I would share a case study in why you should be careful where and how you book. This is a real life case study of the effects of the Aerolineas Argentinas strike on 31th October 2017 an the consequent actions that resulted between the 27th of October and 1st of November to help resolve problems for Chimu Adventure’s passengers. At Chimu Adventures we do quite a few Antarctica charters throughout the Antarctica season. These are special departures and as part of Chimu Adventures philosophy of giving back, they are often fundraisers for a charity or something of that ilk. But you can read about that elsewhere if you like, in this article I want to talk you through the problems (and solutions) that we had around a charter we took on the ship M/V Ushuaia, departing 1st of November, 2017. It was Friday the 27th of October when we first heard that staff at Aerolineas Argentinas (the Argentinean national airline) were going to strike on the 31st of October for a full day. This raised alarms for us immediately as we knew our charter departed the following day and generally we ask people to arrive in Ushuaia a day before the ships departure, just to be safe. Essentially, most of our passengers would be flying on the day of the strike. The other factor to consider was that in the summer months the flights to Ushuaia are normally completely booked out. Ushuaia is the gateway to Antarctica and as such the flights are obviously packed with Antarctica passengers. But it’s not just Antarctica passengers though, many Argentineans take summer holiday trips to Ushuaia, too, to explore the National Parks in the area. Getting new seats on the 30th of October or 1st of November (the days either side of the strike) was going to be problematic as the flights were mostly full. This was especially a concern as we had a shipload of 88 people to potentially re-organise. With our Antarctica cruises we offer the option to book flights with Chimu Adventures (or the customer’s travel agent) but often for the sort of reasoning I mentioned at the beginning of this article many people simply choose to book their own flights. It’s not a problem, without knowing better in the past I would have probably done the same and obviously we let passengers decide how much or how little they want to book with us. So we had a mix of both – people who had booked their own flights and people who had booked their flights with us. Given that we had advance notice of the strike we immediately started re-booking customers who had flights booked with us onto seats on the 30th of October or the 1st of November. Fortunately due to the advanced notice we managed to take up most of the remaining seats on these two days. As we had no control over the flights of passengers who had booked flights themselves we had to just wait to hear from them, hope that they managed to find out about the strike while there were still seats left and let us know what their revised plans were. By the end of Friday we had sorted out new flights for all passengers who had flights booked with us. We’d done all we could and just hoped that all remaining passengers managed to sort themselves out. We sent an email out to all passengers, irrespective if they had flights booked with us or not to notify them of the strike and advise them to find alternative arrangements asap. We have by now had updates from some passengers who have booked their own flights but not heard from many others. We didn’t know how many people were at risk of missing the cruise altogether but the unknowns make up about a third of the passenger list. With many passengers in Argentina travelling without a working phone, and as a result unable to do much more than email these people hope that they got the email. Late in the day we found out that the last flight of the day from Buenos Aires to Ushuaia has been cancelled. There were theories that it’s because the plane’s crew don’t want to be stuck in Ushuaia for the whole day of the strike. Whatever the reason the flight is cancelled, leaving six of our passengers high and dry. The next day was the strike and the day following that is the cruise departure, all flights on that day are now fully booked. The first available flight is now the day after the cruise departure. In the meantime we organised some accommodation in Buenos Aires for the passengers, before considering what to do next. We start to look at alternatives. Firstly we consider buses but these are fully booked too and with over 40 hours travel time they wouldn’t even get the passengers to Ushuaia in time. We also look at a private vehicle but even this is doubtful to make it in time. That’s without even considering the discomfort of being on a bus for that long. We look into charter flights and find a six seater option which could potentially accommodate all six passengers. The cost is very expensive and we ask the stranded passengers to consider calling their insurance company to see if they would pay for such an option. Meanwhile we fortunately have a dedicated flight specialist within Chimu Adventures, Anne. Anne knows airlines and the associated reservation systems inside and out. She sits patiently refreshing flights to see if other people cancel seats on flights on the 1st which she can potentially pounce on. We start to get a few emails from the stranded passengers. They are obviously very concerned that they have spent tens of thousands on a trip which they may not even get to take. Nerves are frayed. Suddenly Anne chances across four seats which have appeared for a flight on the 1st (presumably a cancellation). Having to make a decision instantly I ask Anne to grab them and ticket them in the names of the four passengers who have traveled the furthest for the charter. It’s a tough call to make as it essentially ruled out the charter flight option for the two remaining passengers but we take the gamble anyway, knowing that a) two more seats may come available and b) it’s potentially unlikely that all the passengers insurance companies would pay for the charter flight anyway, especially in the time-frame required. So, we have four of the six people sorted, now we have to find a solution for the other two. Anne starts looking at more out of the box alternatives – what other airports are within drivable distance of Ushuaia we ask? In the end Anne finds one flight into an airport at Rio Grande on the 1st of November, more than two hours drive from Ushuaia. There is only one economy seat and one business class seat left on the flight. Again, I ask Anne to ticket them immediately for the two remaining passengers, rather than risk losing them. We managed to find the last two customers a transport option from Rio Grande to Ushuaia and after a long and stressful three days they made it to the ship just a few hours before it departed. It was a mission success, we managed to sort out all of our passengers flights and get them aboard the cruise. It was a tribute to the amazing team we have, both in teams of Anne and the rest of the sales team who deal with flight ticketing and our on ground operations team who helped with the stressed passengers when they were stuck at the airport. The hardest thing from our perspective was not knowing about the passengers who had booked their own flights. Many of them didn’t contact us at all, probably as they were stressed and had their hands full just trying to find their own solution to the problem. Delaying the departure wasn’t something that we wanted to do as port charges in Ushuaia are so high that even delaying departure a few hours could cost us over US$10,000. So we had to just wait until departure time to see if the passengers who booked their own flights and hadn’t notified us turned up. Not an ideal situation for everyone involved and we were powerless to do anything to help them. 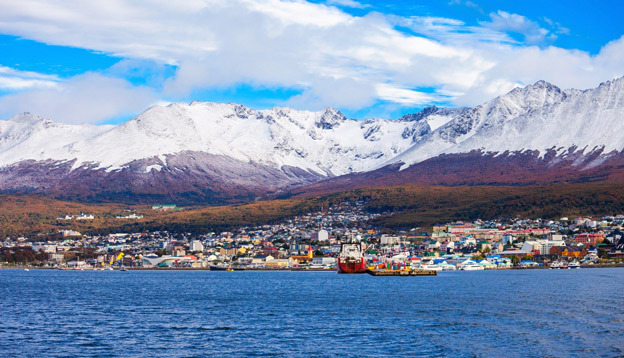 Port of Ushuaia, the capital of Tierra del Fuego Province in Argentina. Photo Credit: Shutterstock. Lessons from the case study? The above was an extreme case, especially from Chimu’s perspective because we had so many clients affected and the stakes for the clients were high (missing a very expensive Antarctica cruise). That said we deal with issues like this on an almost daily basis. Flight changes, or delays on the ground that cause people to miss their flights. Remember that the distances in South America are large and it’s not uncommon for our passengers to take 10-15 flights in a single itinerary. These aren’t simple A to B bookings and on any one of these flights all number of issues could arise. On top of this, ticket conditions in South America can be very complicated. 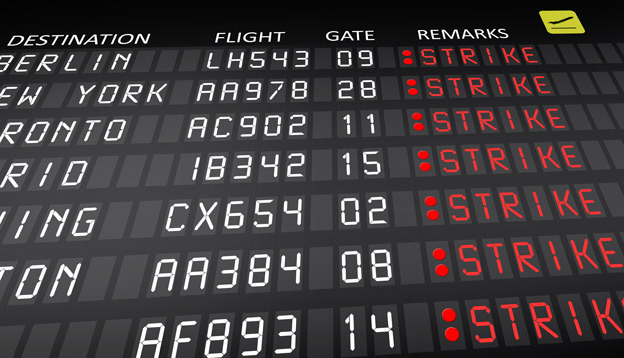 So for example, if not ticketed correctly when a client has connecting flights and one is delayed the clients risk missing their second flight and having no right to compensation for this missed flight. Or the ticket class they have booked on doesn’t give them flexibility to make changes when there is a problem on the ground. Things like flexible tickets sound like they may be more expensive but often they aren’t at all, in fact as a ticketing wholesaler we can often get them cheaper or at the same price as regular scheduled fares that you may see online. Our sales team see these issues all the time and they know how to take these things into consideration to help avoid, or at least minimise the impact to passengers when they travel. I’m certainly not saying we can make all airline related issues disappear but we can help you to plan for these eventualities. If considering a trip to South America I’d strongly recommend you at least have a chat to our sales team about it. If nothing else it’s a second quote for your flights and I’d hope you’ll find that the pricing is very competitive with anything online.